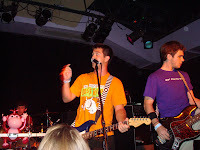 I went to the Boys Will Be Boys album release show last night at Jammin Java. 8 bands played in total. Almost all of them were small bands I had never heard of. Me and my friend were the first people in line at about 4:15 PM. The eighth band was not added until 10 minutes before the show, however they were definitely one of the best. 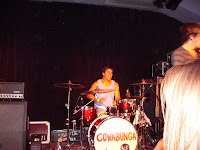 The first band to perform was Cowabunga. Although they had a TON of energy performing, they were not very good musically live. The guitars totally covered up all the singing. I could barely hear any of the lyrics. The recorded versions of their songs seem to sound a lot like Hit The Lights. The good news is that they had fun and that is all that is important for them. I was a much bigger fan of Ever Since Ebbwood. They were definitely much better musically. It's great to see this kind of ability from small bands. They did a cover of Whatever You Like which is currently on their myspace. I don't have too much else to say about them, but are definitely worth checking out. The next band, Pathway To Providence, was a band I had found the night before getting prepared for the concert. And wow, they are great. Also, they are amazingly nice guys. I bought a shirt from them and they made sure to round up the entire band to sign the shirt. I also got a picture afterwards. 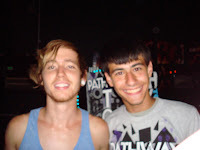 They're fro m Florida and are good friends with two of my favorite bands; There For Tomorrow and Amely. They definitely have a somewhat similar style to the two bands as well. Three songs I have to recommend are I Am The Tower, Hypochondria, and Meet Me At The Terminal. The first two are great rock songs while Meet Me At The Terminal is an amazing acoustic love song. Definitely a must listen band. 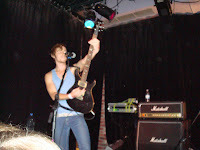 I did not get a very good listen to the next band, Life On High, since I was busy getting the signatures from Pathway. However, I did return in time to hear their single and only recorded song, Say Hello. This song is on Itunes and is a must listen. This song makes me look forward to their next recorded material. They did do a Jonas Brothers cover, which made them lose points on my coolness scale (just kidding guys). The next band was the band that was added last second. 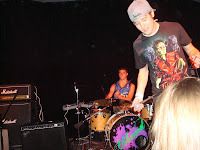 The Icarus Account is a band of two brothers playing acoustic rock. They switch off voices similar to The Scene Aesthetic. They were absolutely amazing live. To be honest I wasn't too thrilled to hear them since I knew I thought it wouldn't be that fun of a performance. That didn't matter. They have amazing voices and are extremely nice guys that care about their fans. I met them before their performance and after it when I went up to them to buy my friend her CD/Shirt (totally worth it) they remembered our names. This band could easily bust out in the way of The Scene Aesthetic. 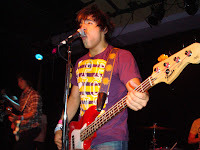 They put their Burn (Usher) Cover up on purevolume for free download. The next performance was by B.Faithful. He is a former rapper who recently turned to electric pop. It was absolutely terrible in my opinion. He overdid the autotune and basically boasted about using it. He also had a "fanclub" of absolutely drunk girls that went up stage and "danced." I really don't have much more to say about this at all. Finally, Boys Will Be Boys went on. Although I had seen them play before, I never saw them play full band. I was not let down at all. The singer, Lehi, had a cold and had a bit of difficulty performing; however he still did a great job. 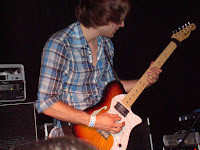 The guitarist, Joe, was absolutely amazing on guitar. Some of the solos during songs I had no clue were actually played. He totally owned them and throughout the night played some of the best guitar I had ever personally seen. They played Make This Count, Forever, Jaded (Forget You), Word On The Street, Stop Calling Me, a cover of All The Small Things, Until I Leave, and Thats What's Up. I definitely suggest to everyone to buy the CD. It's great. The show was definitely worth going to. I do want to say that I feel honored that BWBB has looked at the blog and actually remembered me from their other show. It means a lot that bands actually support the blog. That was one of my reasons for making the blog. I want to get to know bands and I want to tell people about them. I also became friends with many of the other bands during the evening. Support them all!